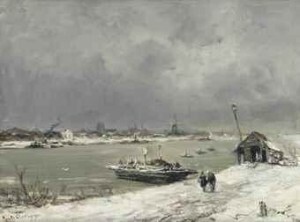 A specialist in winter landscapes, Louis Apol was born with a natural talent for painting. His father sent him to private lessons from a very early age, and he was later given a grant by King William III to further develop his artistic gifts. 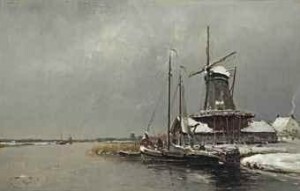 In 1869, at the age of 19, he took part in exhibitions in The Hague and Amsterdam and began to exhibit abroad shortly thereafter. His winter landscapes frequently won prizes and he received his first gold medal in 1872. Queen Wilhelmina and her mother Emma both bought his paintings and his work also enjoyed a great deal of success in other parts of Europe and in the United States. 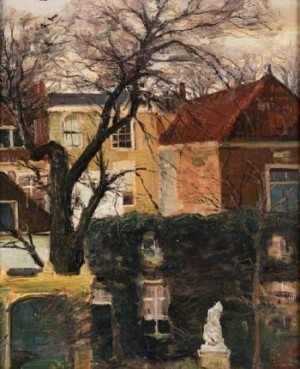 The purchase of one of his monumental winter landscapes by the Rijksmuseum when Apol was still only 25 years old marked the official recognition of his contribution to the genre, the essence of which lies in his having broken with a Dutch tradition of filling winter landscapes with figures, especially skaters. The majority of Apol’s landscapes are devoid of figures, which enhances their desolate mood. The Romantic atmosphere evoked in his paintings is still highly regarded today.